There is no reason for you to fear understaing the Nitrogen Cycle process. The mystery created by internet confusion is swept away with one simple diagram and few minutes of thoughtful discussion. Your new aquarium is a pristine glass box with rocks and water inside until you add fish. It is a simple fact that they poop when you feed them. When they do this, they then breath and live in sewage. 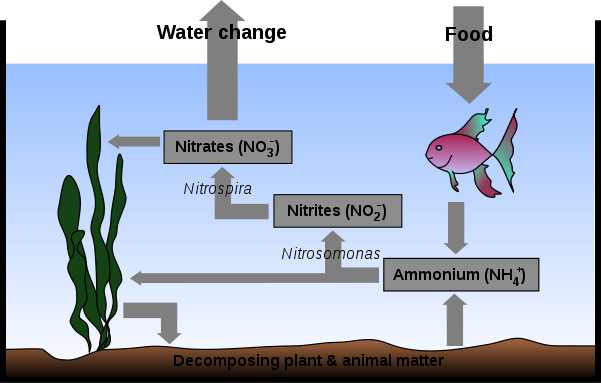 The Nitrogen Cycle is nature's way of making that sewage into a managable fish byproduct. As shown in the chart above, you put food in the water. Your little friends eat as much of it as they can get in their stomachs. The rest falls into your substrate (rocks or sand). Along with the leftovers that your fish couldn't finish go the waste that their bodies didn't need. All that mixes and creates a chemical decomposition process which releases Ammonium into the water. Ammonium in high enough concentrations will kill fish. Little bacteria that attatch themselves to every surface in the aquarium love to eat this Ammonium. They convert it into Nitrites when they get rid of their wastes. Nitrites in high enough concentrations will kill fish. Along come a different kind of little bacteria that also live on every surface in your aquarium. Those guys love to eat Nitrites. They convert them into Nitrates when they get rid of their wastes. Nitrates in high enough concentrations will kill fish. So what you are left with at the end of this process is a particular set of chemicals that you must get out of the fish poop sewer water. You do regular water changes to remove the Nitrates and replace the dirty water with clean water. This dilutes the Nitrates to a safe level for the fish. Aquatic plants can assist with this process, but they can also add to it if they are not cared for. The whole system is a balance. To many fish, or fish that are to large for the system, can stack up any one of the three deadly chemicals to a lethal level. Finding the balance is the trick. I will say that again at a normal tone of voice. Good filtration (the correct size and type of filter) along with regular water (every one to two weeks as dictated by water testing) and media (every 4 to 6 weeks as dictated by water testing) changes control this process. This is the key to good fishkeeping. Regular maintenance. Get in the habit of it and you will have very few fishkeeping worries. The other trick in this process is getting it started. This is called Cycling. We will discuss how to kickstart Mother Nature with two different methods in the Fishless Cycling and Cycling with Fish pages. See, Nitrogen Cycle, simple concept. Ok, public service message over. We return you to your regular programming. For detailed information, see Wikipedia's Nitrogen Cycle page.